On the evening of 31 January 1978, just as the good people of Sligo were about to party like it’s 1979, a UFO appeared in the sky. It caused quite a reaction, according to The Sligo Champion of 5 January 1979. Gardai and an Army helicopter took part in a search on New Year’s Day for a UFO sighted the previous night over counties Roscommon and Sligo. Three people in the Riverstown area of County Sligo sighted the mysterious flying object at about 7.30 p.m. on Sunday night and Mr. Dave Ryan and his family of Cartron Heights made a similar sighting around the same time two miles from Boyle, Co. Roscommon. A number of other people from Roscommon, including a Garda, also saw the UFO. Mr. Ryan was travelling back from Tipperary with his wife, Margaret and their five children, when his attention was drawn to what he though was a falling star. “About two miles on the far side of Boyle I noticed what appeared to be a star travelling horizontally in front of us. “It was moving at about the same speed as an aeroplane and was about the same distance from the ground as one would expect an aircraft to be,” he recalled yesterday. “I stopped the car and got out to watch the object, which seemed to be getting longer all the time. Then a tail of fire appeared on it and moved off in the direction of Carrick-on-Shannon. “It was very much like a firework and my children weren’t in any way frightened by it,” he recalled. Mr. Eugene Taheny of Knockbreenagher, Riverstown, and his son, James, were on their way to Sligo when they sighted the strange object. It seemed to them that the UFO struck a hill at Drumsooey, near Gleann. Mr. Patrick Torsney of Riverstown, was another person from the area who spotted the UFO. Within minutes, the sighting was reported to Gardai at Riverstown who searched the area for about two hours on Sunday night. The following day an Army helicopter from Finner Camp took part in the search but no trace of the mysterious object was found. A Garda stationed at Boyle, Co. Roscommon, saw the object for about two minutes on Sunday night. He described it as the strangest thing he ever saw in his life. “It was moving very fast in a north-easterly direction. It was like a big flame in the sky – very bright with a tail of light. It definitely was not an aircraft. I watched it for a few minutes until it disappeared from view. It did not appear to fall to earth,” he said. The new reports of UFOs in the area follow closely similar sightings by a number of people in the Hazelwood area a few weeks ago. Over the past couple of weeks, a number of sightings have been reported from all over the country, notably in Donegal where a large number of people have seen mysterious flying objects. New Year’s Eve of 1978 was quite a big night for UFOs, with many sightings reported across Ireland and the UK. Possibly the most interesting report came from Runcorn, in Cheshire, where 13-year-old Andy McDonald was riding his bike near his home. Andy’s experience lasted about 10 seconds. 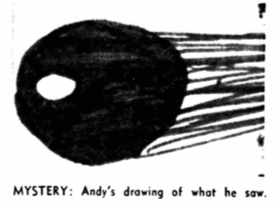 According to the Daily Mirror, experts believed “it was either a meteor or a satellite breaking up” that was behind the sightings and Andy's strange experience. Not so, said the Armagh Planetarium. They had been inundated that night with reports of a UFO that had crossed Northern Ireland at 7 pm. And by doing whatever it is they do – maths and stuff, probably - astronomers at the facility were able to conclude that the object that had caused the sightings in Ireland - North and South - and across the UK was part of a rocket that had launched the Russian satellite Cosmos 1068 into orbit on 26 December 1978. For me, the timings don’t really work out. According to the Planetarium’s calculations, the rocket part was already in the North Sea by the time the Sligo sightings began. We would have to assume that everyone in Sligo is an eejit and mistook 7 pm for 7:30 pm. And according to Ken Rogers, who was chair of the British UFO Society at the time, there were more sightings at about 9pm and 11 pm – though mostly in London - that night. These sightings involved stationary objects: one was cigar shaped, the other looked like a bright star. Also, the Sligo sightings came during a period of Irish UFO activity, activity which didn’t end on New Year’s Eve. Anyway, as always, if you have anything to add, please get in touch.